It dawned on me this week that my first novel, Ghost Horses, was published twenty years ago in 1996. The idea shook me up a little. Teen readers who read Ghost Horses just after it was published are now in their thirties. It doesn’t seem like two decades have passed since I received that small, slim envelope from Holiday House that transformed my life. “Another rejection letter?” my husband asked, as I walked back from the mailbox that day. “No, I don’t think so. Rejections come in big, self-addressed, stamped envelopes—with the manuscript,” I reminded him. Not quite trusting my own explanation, I opened the envelope slowly and unfolded the typewritten letter. I can’t remember what happened next. Did my husband throw his arms around me? Did we dance around the kitchen table? Did the three of us—my husband, daughter, and I—go out to dinner that night to celebrate? Funny how those details fade from memory. I just remember thinking that Ghost Horses was going to be a book; its main character, Tabitha Fortune, would soon spring from my imagination into the imaginations of young adult readers—or so I hoped. Now acceptance letters—and rejections (if you get them these days)—arrive by e-mail, just one of many changes in the publishing world over the last twenty years. But how has Ghost Horses held up over the last two decades? As a book about dinosaurs, has Ghost Horses become a literary dinosaur itself? Ghost Horses is set in South Dakota in 1899 and 1900, when the world was changing dramatically and quickly. People were apprehensive about the new century-- what changes would it bring in science, technology, religion, education, even family life? It was the era of the emerging New Woman, who had interests beyond home and family, interests that often placed her in conflict with society’s expectations. Tabitha is caught up in these issues and Ghosts Horses explores her journey to find herself and her place in an evolving world. The book’s setting paralleled what was happening when I wrote Ghost Horses in the mid 1990s, as the world worried not only about an approaching new century, but a new millennium. Twenty years ago, when historical fiction was still a popular genre for young adults, I believed a glimpse into the past would give young readers a deeper understanding of contemporary issues, and help them sort through conflicts in their own lives. Most editors and publishers felt the same way; YA historical fiction was published regularly along with contemporary fiction, sci fi, and fantasy. Young adults read historical fiction in those days. In retrospect, it isn’t surprising then that Ghost Horses performed respectably for a first novel by an unknown author. The book was a Junior Library Guild selection and a finalist for a Golden Spur Award from the Western Writers of America. In 1999, it came out as a paperback. Yet even back in 1996, I began to suspect that YA historical fiction was in trouble, that it might become a literary endangered species. Shortly after Ghost Horses was published, the book came under fire for its depiction of life at the turn of the last century. A lone reviewer found the entire premise of the book completely unbelievable. What kind of society, the reviewer argued, would discourage a girl from pursuing a career in science? Loving parents have always encouraged their children—regardless of gender—to follow their dreams. Ghost Horses, the reviewer concluded, was therefore unrealistic and irrelevant. I knew the reviewer was wrong, of course, but consoled myself with the thought that maybe in 1996, it did seem impossible that girls had ever faced educational and professional barriers. Maybe the women’s movement had actually transformed society and popular culture so much that gender equality had become conventional, that it seemed inconceivable that gender had ever been an issue for women, not just in the sciences, but in society at large. Yet in my heart-of-hearts, I was astounded that a professional reviewer could know so little about American history. Was history’s literary influence fading? Now twenty years later, as the 2016 presidential campaign nears its end, I’m more convinced than ever that large blocks of the American public know almost nothing about the history of American women. Hillary Clinton’s historical presidential candidacy has failed to resonate deeply among voters, especially young women; the barriers Secretary Clinton fought throughout her career mean almost nothing to them. That reviewer back in 1996 anticipated a trend. A generation of young Americans have little appreciation for or experience with American history in any form. They’ve lived almost exclusively in the moment—or perhaps if they’re readers or gamers, they’ve escaped into fantasy or dystopian worlds that may have contemporary social relevance, but little historical perspective. Ghost Horses went out of print over ten years ago, yet it seems more relevant than ever. The social issues I raised in Ghost Horses may have been grounded in history, but they haven’t gone away. The clashes between science, religion, and feminism were very real in 1899 and 1900, and continue today, only slightly camouflaged by twenty-first century media spin. The clash over equal rights and equal opportunity, birth control and abortion, feminine versus masculine occupations all have their roots in the social and cultural battles women fought over one hundred years ago. What may surprise many people today, however, is that in 1900, science was often at odds not only with religion but with the idea of women’s equality. The most outrageous passage in Ghost Horses is a quotation from the late nineteenth century social scientist Gustave Le Bon, who wrote, “Without a doubt there exist some distinguished women, very superior to the average man, but they are as exceptional as the birth of any monstrosity as, for example, of a gorilla with two heads; consequently, we may neglect them entirely.” He went on to say that "women represent the most inferior form of human behavior and are closer to children and savages than to an adult, civilized man." Le Bon’s comments aren’t that far afield from those made by Secretary Clinton’s opponent during this presidential election. Donald Trump claims that Secretary Clinton doesn’t have “the stamina” to be president, that she is fundamentally unsuited for the job. He discounts her resume and experience, implying that her gender limits her physical, mental, and intellectual capabilities. The unspoken heart of this presidential campaign has more to do with sexual politics than party politics. American women may have won the constitutional right to vote in 1920, but we continue to battle underlying assumptions about our perceived inferiority and place in society. 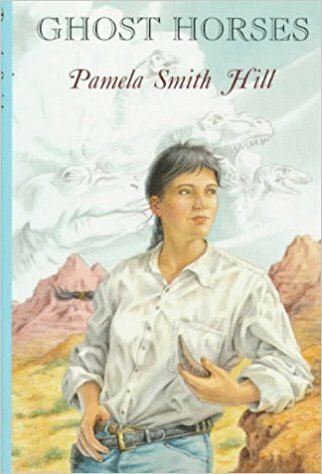 In Ghost Horses, Tabitha fights essentially a gender battle—not to be president, but to become a paleontologist. While young women today will find it easier to study whatever interests them – paleontology, law, engineering, mathematics, medicine, computer science—significant barriers remain: unequal pay; sexual harassment; limited parental leave; violence against women; expensive and inadequate health care; the glass ceiling. This list isn’t radically different from the barriers our foremothers faced. So twenty years later, I find that Ghost Horses is more relevant than ever, though it remains out of print. And no matter what the outcome of this election, no matter what strides women make over the next twenty years, books like Ghost Horses can simultaneously illuminate the past—and the present. If only they could once again find their way into the hands and imaginations of young readers….